Sponsored by the Chicago Headline Club, the Gridiron Show skewered local politics and media from 1987 to 1997. A labor of love by a kooky bunch of journalists, pr peeps and politicians, it was also a benefit for student scholarships. 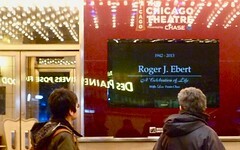 This bit between Gene Siskel and Roger Ebert is laughing out loud funny. Writing is attributed to Adam Ritt, with tweaks by the critics themselves. The video is out of synch but listen to the audience response.